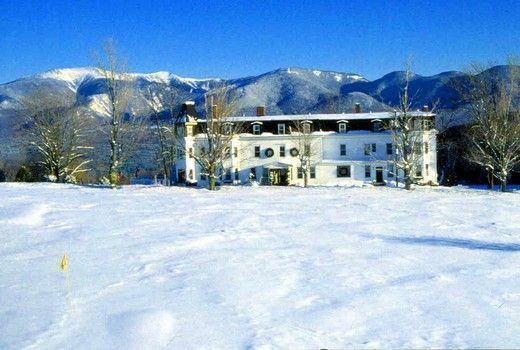 New England is not an easy place to get to know in winter, but Sunset Hill House in Sugar Hill, New Hampshire is an island of light in snowbound seas. When the dark and the cold and the snow hold the land in a formidable grasp, and people disappear into their homes and cafes, Sunset Hill House, festooned with lights and sparsely placed globes, is a warm, welcoming, well-lighted place to stay. The kind of place a traveler is glad to get to. This 100-year-old, white-shingled inn is perfectly situated at the northern edge of the brooding White Mountains. The glassed-in breakfast room looks out over a distant small village seemingly afloat in the shadows and sunlight, while the west facing rooms are perfect perches for the dramatic sunsets and a snowy tundra that stretches and stretches. Once part of the Grand Hotels of New England, today it's adjusted to modern times with upgraded facilities, solar panels, a fine dining area, while still retaining the feel and look of the Grand Hotel it once was. The rooms are typical for a New England inn. Some with jacuzzis, some with fireplaces, all very comfortable, unpretentious and with free WiFi, a service conspicuously absent in more expensive and elaborate hotels. Sunset Hill's Nancy Henderson says she's the world's "happiest innkeeper" and it shows. In addition to warm lighting, she uses email to welcome her guests before they arrive. She includes a little history of the inn, introduces herself, and explains the attractions of the region. Your teens will appreciate that she also asks guests to share in answering the innkeeper's dilemma — what room to redo next; suggestions for new breakfast items — via her Facebook page. Inns often do live on the reputation of their breakfasts, and just as often on their dinner and bar service. After all, after a day of skiing or hiking or just plain exploring, a good drink and a memorable meal are deeply appreciated. And guests at Sunset Hill are not disappointed, at least with the pub service and breakfast. We found the Fine Dining menu too pricey for us ($34 00 for basic entrees like pan seared scallops, or a fish du jour), but breakfast was a delight. Marti Mayne, CEO of Maynely Marketing, is a veteran user of video sharing, Facebook and Twitter to "expanded the appeal of inns beyond the traditional baby boomer market to include more Gen-X and Gen-Y travelers." Try social media outlets for advice on booking your next B&B stay, with resources such as the Better Way To Stay campaign, run on behalf of the B&B industry including Sunset Hill House,to reach travelers who love inns – and those who haven't yet discovered them. There's lots to do in the area, and thoughtfully Sunset Hill House provides a comprehensive and informative list with breakfast. They have their own small, but delightful 9-hole golf course (New Hampshire's oldest, we hear), with "postage stamp" greens, and with enough 'white stuff' you can snowshoe, and ski right from the Inn. The 'don't blink' Village of Sugar Hill itself boasts the iconic Harman's Cheese Shop, which has some of the best cheddar we've tasted anywhere. Franconia, just down the the road from the inn, is a rustic town with one good restaurant, The Dutch Treat, a good coffee shop and small grocery store. A bit further north the town of Littleton with its quirky mix of shops, diners and restaurants, the longest penny candy counter, a thriving bookstore and old covered walking bridge, caught our nostalgic fancy. And maybe it will yours.